If you were looking to purchase a fitness gadget, there are many in the market which claim to monitor your movement, sleeping patterns and calorie count which you would think are all necessary for maintaining a healthy lifestyle. However there are many key contributors, which until now have been unattainable without medical equipment, these include heart rate, heart-rate variability, blood oxygen levels and respiratory rates. 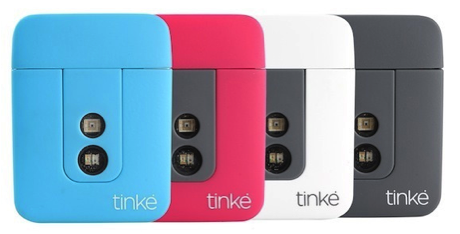 Tinké is the new gadget from Zensorium, which is becoming recognised as a more health conscious device due to its ability to monitor all these other key health statistics, which are data worthy of sharing with your doctor. The small gadget weighing in at just 10.7 grams and resembles the size of Apple’s iPod Shuffle come in a variety of bright colours appealing to all markets, it also features two sensors on the front, a 30-pin connector hidden beneath a lid and two colour-coordinated metallic strips. There are no batteries, screens, chargers or cables necessary. In fact the device works by plugging it into your iPhone or iPad and entering all necessary indicators, so the gadget understands the user. Once you’ve created an account you place your thumb on the front indicators and then it gives you a VITA score out of 99, as well as data on your breaths per minute, heartbeats per minute, and oxygen level (as a percentage). From these results Tinké will also offer you recommendations for example “your heart rate is fast, try taking deeper breaths or relax”. The device has potential to be a real hit and is definitely unique in this crowded up coming market.